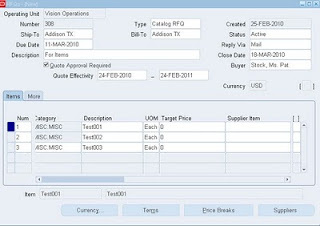 This Post is about How to create Supplier List and RFQ in Oracle Purchasing. In the post I will explain about the Supplier List and how to use Supplier List and Price breaks while creating a RFQ. Catalog – Its supports Price Breaks. These can be copy to a Blanket Purchase Agreement. Once you select the Supplier list , system will add all the supplier to supplier List. Your RFQ is now Ready , you can Print your RFQ.